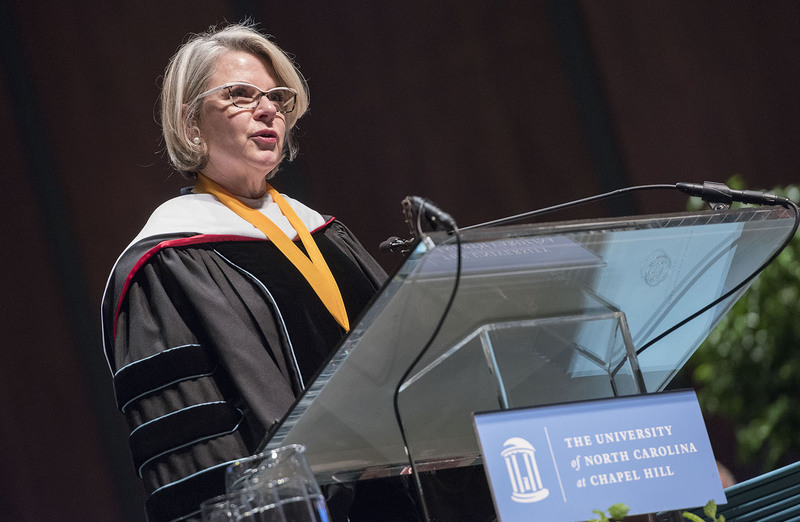 Multiple media outlets reported Thursday that Margaret Spellings will leave the presidency of the UNC System, possibly by early next year. The News & Observer of Raleigh cited three sources in saying that Spellings, who started in the job in March 2016, will return to her home in Texas. “In recent days, Spellings has quietly negotiated her departure with the UNC [System] Board of Governors,” the paper reported. A source told the Review that the board would meet Friday morning and announce her departure. Spellings’ current five-year contract was set to expire in February 2021. Spellings, a top aide to George W. Bush during his presidency who rose to the cabinet as secretary of education, has spent more than three decades in education and public policy work. She succeeded Thomas W. Ross ’75 (JD), who was pushed out of the position in 2015 by the Board of Governors after five years. Most of the 28 current members of the Board of Governors were not on the board when Spellings was chosen. Elected by the N.C. General Assembly, the membership is dominated by Republicans. A year ago, a majority of the board proposed a host of changes in the UNC System, including lowering tuition and fees, reorganizing Spellings’ staff and possibly moving the UNC System office away from Chapel Hill. Some board members saw this as meddling in the president’s ability to manage the operation; others insisted reforms were needed. Her election had been forged in controversy. At the time she was chosen, in fall 2015, at least two Board of Governors’ members called for then-Chair John Fennebresque ’70 to resign over what they called a breakdown in leadership and the failure of the search committee to keep other Board of Governors’ members apprised of the search progress. Following a meeting of the search committee in October 2015, the entire board was called to an emergency meeting set for two days later at which it met with Spellings. Shortly afterward, a meeting to elect the new president was moved up by a week. Faculty across the 17-campus system were upset that they were not included in the search process. Their Faculty Assembly released a statement that read in part: “The recent mismanagement of the Executive office of the University [system], from the firing of Thomas Ross, to the hiring of the new President, is but the most egregious in a long train of problematic governance actions. Ross had made it clear he was not ready to retire. On the day Ross was ousted, Fennebresque offered no clues as to why the board shortened his presidency; little in the way of explanation emerged thereafter. Spellings, 60, previously led the George W. Bush Presidential Center. In that role, she oversaw the operations of the former president’s foundation, public policy institute and, in collaboration with the National Archives and Records Administration, his presidential library and museum. She managed Bush’s domestic policy agenda as a White House domestic policy adviser from 2001 to 2005. She oversaw the President’s Emergency Plan for AIDS Relief and helped develop a comprehensive immigration plan. She also oversaw initiatives on health and human services, transportation, labor, justice and housing. In 2005, she worked closely with a key higher education issue — accessibility and affordability — when she convened the Commission on the Future of Higher Education. During that time, she represented the Bush administration’s development and implementation of international education agreements with several countries, including China, Russia and the United Arab Emirates.